The island of Sainte Marie, or Nosy Boraha, is a narrow granite island located five miles off the remote east coast of Madagascar. This postcard tropical island with lush vegetation, sandy beaches, shallow bays, and coral reefs was once home to over a thousand pirates. The island was located not far from the 17th- and 18th-century maritime routes along which ships laden with spices, ivory, silk and other riches returned from the East Indies. Sainte Marie provided the buccaneers a secure shelter from where they could plunder the approaching ships. The island’s numerous bays and inlets protected their ships from storms; the abundant fruits and local women satisfied their hunger and lust. The pirate settlement on Sainte Marie was founded by the famous English pirate Adam Baldridge, who came to Sainte Marie in 1685 after fleeing Jamaica where he was wanted for murder. Within a year, Baldridge had established control over the inland waterways into Sainte Marie and its harbor. He subdued the local tribes and forced the native chieftains to pay Baldridge in cattle, food and women. Baldridge forged a partnership with a wealthy New York merchant and ran a very successful business exchanging money and goods with the pirates. Baldridge would acquire plundered loots from the pirates and ship them to New York in return for basic supplies, rum, tools and ammunition, which he used to trade with the pirates. Baldridge also offered the pirates many of the island’s resources such as different types of fruits (bananas, coconuts, lemons, oranges, pineapples, yams) and livestock (cattle, chicken, fish and turtles). He had dozens of warehouses on the island filled with both the treasure he collected from the pirates and the merchandise he traded to them. At its peak, about a thousand pirates lived on the island including legendary and infamous characters such as Captain William Kidd, Robert Culliford, Olivier Levasseur, Henry Every, Abraham Samuel and Thomas Tew. Baldridge himself lived an extremely extravagant life. He built himself a hilltop mansion and fort, and kept his own harem of island women. Baldridge also started engaging in slave trade. He would buy slaves on the east coast for cheap and sell them to passing ships or send them to America and the West Indies. But when Baldridge tried to sell some of the local natives, the island population rose up in revolt and destroyed his castle and warehouses, forcing Baldridge to flee the island in 1697. After the departure of Baldridge, the pirate colony fell into decline as they were unable to get the vital supplies necessary for sustaining a population. By the 1700s, the golden age of buccaneering had come to an end. Many pirates surrendered to the conditions of clemency and settled down in Madagascar. They married local girls, raised families and died on the island. Their remains were interred in a cemetery, now called the pirates’ cemetery, at île aux Forbans, a small island located in a bay just south of Ambodifotatra, the island’s main town. Today, Sainte Marie gets a lot of tourists drawn to the idyllic tropical paradise where diving, snorkeling and whale watching are the favorite past times. 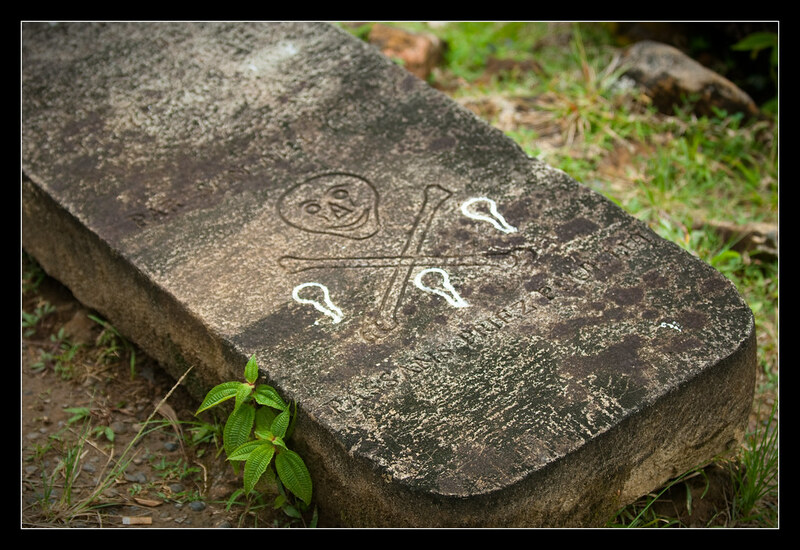 The pirate cemetery, which is now overgrown with bushes and plants, is another popular attraction.